For many people, diving or snorkelling are the highlights of their holidays. Almost nothing is as spectacular as exploring the deep blue sea and discovering hidden worlds you’ve never seen before. It’s also amazing to record this beautiful and alien-like world visually using photos or videos. Because you can’t just go diving with your phone or your everyday camera, you need a waterproof camera for diving or snorkelling, or at least a suitable underwater housing for your “normal” camera. But which are the best cameras for diving and how do you choose the right one? Because we love diving ourselves, we decided to do the research for you. We’ve talked to underwater photographer buddies, trawled the electronics sites, and made some selections based on the camera and housing models currently available on the market. In this post, we present to you the best underwater cameras and housings for diving for every budget! Underwater photography is not the cheapest hobby in the world. If you want a good underwater camera with a reliable dive housing, you’ll have to spend about USD 400-1’000. This doesn’t include any strobes or accessories. Because of this, it is very important that you know exactly what you need and your budget range. In this post, we’ll give an overview of different cameras in various price categories. We’ll always show you a suitable underwater camera housing for a regular camera as well. A little tip: If in doubt, rather spend a little less on a camera but invest in decent housing. Because if the housing leaks underwater, your camera will be destroyed. If you are looking for the best underwater camera for snorkeling, the price will be a lot lower, as you can get cameras that are already waterproof without housing to a certain depth. With the exceptions of the GoPro HERO7 Black, the Olympus Waterproof Camera TG-5 and the SeaLife Micro 2.0, most cameras for underwater photography are simply normal cameras which need an additional waterproof camera housing if you want to take them on a dive. So one of the most important things to check before you buy the best camera for underwater photography is, that the camera itself is waterproof or that there is a dive housing for the chosen camera available. The top brands like Sony, Canon, Panasonic, Nikon and Olympus are generally well supported by the top housing manufacturers. However, not every single model has suitable housing available. If you want to buy a camera for diving you have generally three options of system types: Compact, mirrorless, DSLR. Those camera types can highly vary in price and quality and each has its pros and cons. Therefore, it can be quite tricky to find the best diving camera for your personal needs. Sometimes the simplest can be the best. Especially for beginners I really recommend compact cameras because all you have to do is to point and shoot. They are also light and compact, which makes them great if you’re tight on baggage weight or space. The fact that they are also the cheapest models makes them the best dive cameras for beginners. The con with most of them is, that they lack in quality and light performance compared to more expensive cameras. I recommend compact cameras mainly as dive cameras for beginners, people with a budget under USD 1000 or divers who like to be able to switch from macro to wide angle underwater. Compact cameras are also the best cameras for snorkeling. Some of the best underwater cameras for scuba diving are mirrorless cameras in a suitable underwater housing. Because they are not as big, bulky and expensive as full DSLR cameras, a lot of underwater photographers swear by them. The fact that you can also use different lenses makes them perfect equipment for diverse sea-world photography. While they have 4-8x larger sensors than compact cameras, they’re also more expensive. Also, because you can’t change lenses underwater, you have to decide before the dive whether you want to attach a macro or wide angle lens on your best underwater camera for scuba diving. Mirrorless cameras are perfect for experienced divers who’d like to take their underwater photography to a next level and people with a budget higher than USD 1000. In terms of photo quality, DSLR cameras definitely wear the crown. They have the widest range of lenses available and have a superb low light performance. While mirrorless cameras get better and better, there is still no mirrorless as good as a DSLR. On the negative side: DSLRs are large, heavy and definitely the most expensive dive cameras you can get. Like with the mirrorless cameras, you can’t change lenses once you’re under water. DSLR cameras are mainly recommended for professional underwater photographers and people who only want the best cameras for scuba diving. If you’re looking for the cheapest camera for diving, then take the smartphone you already have and put it in a waterproof pouch. This is the simplest and easiest way to create a cheap underwater camera for snorkeling and take some underwater pictures. The photo resolution of the current smartphones on the market is pretty good and you’ll be able to get some decent underwater photos. Be aware that it will not be in the same high quality as the more expensive solutions. However, some pouches, like for example the JOTO, are IPX8 certificated waterproof, which means that they keep your phone waterproof up to 30 metres (100 feet). That said, I recommend using them only as snorkelling cameras and not for scuba diving. The GoPro Hero 7 Black is probably the best budget scuba camera. It’s waterproof up to 10 metres (33 feet) underwater without a housing. The GoPro underwater camera shoots videos in 4K/60fps quality and takes photos in 12 megapixels. One of the newest and most talked-about features is the Hypersmooth Image Stabilisation. This gimble-like stabilisation is really noticeable and greatly improves the smoothness of video clips compared to previous GoPro models. It’s fairly common to see professional underwater photographers carrying camera equipment worth in excess of USD $10k also using a GoPro as a scuba camera for videos. The GoPro Hero 7 Black is definitely the best underwater video camera. While all three editions (Black, Silver and White) of the GoPro Hero 7 are waterproof up to 10 metres (33 feet), only the GoPro Hero 7 Black is compatible with the official Super Suit dive housing which allows you to dive with it down to a depth of 60 metres (196 feet). If you’re looking for a cheaper diving case, then have a look at the Kupton Housing. It’s less than half the price of the original GoPro accessory. The downside is, that it’s only waterproof to up to 45 metres (147 feet). If your budget is rather small and you mainly want to use a camera for snorkeling, then the GoPro Hero 7 white is still one of the best underwater cameras for snorkeling. If you are interested in great pictures and versatility for a decent price, then the Olympus TG-5 is the perfect choice of an underwater camera for beginner. The Olympus underwater camera shoots videos in a 4K/30fps resolution and pictures in 12 megapixels. Without an additional housing, it’s waterproof up to 15 meters (50 feet). The Olympus TG-5 has the highest autofocus speed and accuracy among all compact cameras suitable for diving. The TG-5’s absolute highlight though is the unsurpassed macro shot mode. No other scuba diving camera on the current market has a higher reproduction ratio than the Olympus TG-5. This makes it the best camera for scuba diving in the reefs. With many different functions, this dive camera is not only good underwater but also above the water. We think, that with its great versatility, the stable picture quality and the fact, that you can dive with it down to 15 meters without a case, the Olympus TG-5 is the best underwater camera for diving. Personal note: We’ve used our own Olympus TG-5 on several dives in Mexico. There are some characteristics I’d really like to point out. First of all, I love that the camera itself is waterproof down to 15 meters. I’d rather know that I have a camera which is absolutely waterproof, than having an expensive standard camera in an underwater housing. After all, if the underwater housing fails, your non-waterproof camera will be destroyed. Especially for divers with a standard Open Water Certificate and a dive limitation of 18m, the TG-5 is the perfect underwater camera, as you’ll rarely dive deeper than 15m and therefore don’t need any additional housing. This brings me to point 2: The compactness of the Olympus TG-5. When you dive with the Olympus TG-5 to depths of less than 15 meter, you can simply put your camera in the side pocket of your BCD when you’re not using it to snap photos. If you want to dive deeper, you’ll have to get yourself a housing for the Olympus TG-5. The best underwater housings are the Olympus Underwater Housing PT-058 and the SeaFrogs 60m/195f Housing. The official Olympus housing can withstand pressure to a water depth of 45 meters (147 feet) and a camera control dial can be used to reflect the underwater photographer’s preferences. With the cheaper SeaFrogs underwater camera housing, you can take the TG-5 down to 60 meters (195 feet). It also comes with included accessories like, for example, a red filter lens. Because it allows you to dive deeper, the SeaFrogs housing is our own choice for the best underwater camera housing for the Olympus. We also think that it feels very comfortable holding it in your hands, and it comes in a funky yellow colour. 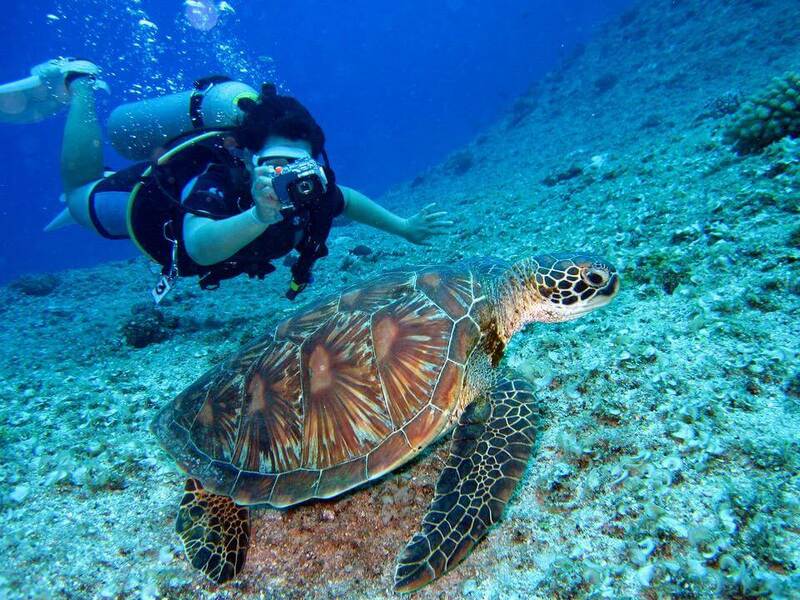 SeaLife is a brand known for producing top waterproof cameras specifically for underwater photography. The SeaLife SL512 Micro 2.0 is a perfect example of how good they are with doing this as well. The camera is waterproof up to 60 meters (200 feet). It doesn’t need special housing. This keeps the price and the weight of your equipment significantly down. The fisheye lens captures videos in full HD/30fps and photos in 16-megapixel quality. One of the great functions is, that you can capture a picture while you film a movie. Setups like colour correction and automatic exposure control make this underwater camera for scuba diving very beginner friendly. While all around it can not reach the quality of the Olympus TG-5, it is still one of the best cameras for underwater photography under USD 600. Especially because of the fact that you don’t need an additional housing for deep dives. We included the Canon G7X Mark II already in our post about the best travel cameras. So, we weren’t surprised when we found out from dive buddies that the G7X Mark II is also one of the best cameras for diving once you add a decent underwater housing. This Canon camera films in Full HD and takes pictures in a 20.1-megapixel resolution. It has a maximum aperture of f/1.8 at 25mm and f/2.8 at 100mm. This allows you to capture a lot of light, which helps in underwater conditions. Like all the other cameras in this category, the G7X itself is not waterproof. In terms of value, it is definitely a winner. Especially because it doubles up as a great travel camera for photos and videos. Because the Canon G7X Mark II itself is not waterproof, it’s very important to get a high-quality dive housing for it. The range of housings for this camera is quite broad, so we show you the two best dive housings for the Canon G7X. The Canon WP-DC53, for less than USD 400, keeps your camera waterproof up to 39 meters (130 feet). The Ikelite Housing might be a little more expensive, but it seals your camera tight up to 60 metres (200 feet) and has a near neutral buoyancy in fresh water. The Canon EOS 5D Mark IV is the crème de la crème of DSLR cameras and one of the best underwater cameras for diving when you pair it with an underwater case. With a proud price of more than USD 2’500, Canon delivers a top of the line camera that was designed for photographers who only want the best scuba camera. It trumps with a 22-megapixel full-frame CMOS sensor. This allows you to shoot high-quality photos and videos with decreased noise at high ISO settings. In fact, with the 5D Mark IV, you can shoot pictures with an ISO of up to 102400. With that, you can shoot practically in the dark. Combined with a great underwater housing, it’s the best camera for professional divers. The camera itself is not waterproof, but there is a great housing available. The Ikelite housing keeps the Canon EOS 5D Mark IV securely sealed to a depth of up to 60 meters (200 feet) and the two handles on the side allow you perfect control over the camera. The housing is made from corrosion-resistant polycarbonate and makes sure that your camera is safe and sound underwater. Safely wrapped in a underwater housing, the Sony a6500 is one of the best mirrorless underwater cameras for scuba diving on the current market. It shoots photos in 24 megapixel and videos in a 4K/30fps resolution. With the integrated 5-axis in-body image stabilisation, your photos and videos will have a highly reduced blur effect. Furthermore, the Sony a6500 boasts with the currently fastest autofocus in the world (0.05 sec). The ISO goes up to 51200. This great camera for diving reaches the quality of many DSLR cameras at around half the price. It’s definitely one of the best diving cameras for people who love to get some bang for their buck. The Ikelite Housing keeps the Sony waterproof up to 60 metres (200 feet) and has a super sensitive and ergonomic shutter lever. You can also attach single or dual tray and handles. With this great housing, you’re gonna have a lot of fun with the Sony a6500 underwater. Did You Like This Post? Was It Helpful? Then Pin and Share It on Pinterest to Share the Love. Thank You! Underwater photography is a fantastic and rewarding hobby. Rarely can you enter such an exotic world and see things you normally only see in books, TV or other digital media. With the best cameras for diving, you can also catch those moments and share them with your dive buddies and friends around the world. We hope we helped you to find your perfect choice and wish you many happy hours under water. If you are interested in taking pictures from above instead from below, then also have a look at our post about the best drones for travelling. Featured image from Richard Segal on Pexels. Pinterest image from Oliver Sjöström on Pexels.